When people know you like to cook you often get food questions out of the blue. I'm happy to answer even if I have no idea what I'm talking about. It doesn't matter, people want you to know. They need you to know. My approach to food questions? Answer forcefully and with authority; knowledge be damned. The questioner leaves happy and my reputation grows. If I'm wrong, the questioner will always assume they messed up, not me. It's a win-win as far as I'm concerned. Of course, when people learn that you write a food website the stakes increase. They don't just ask you timing questions or spice questions. Every once in a while they ask you to make something for a special event. "We really need someone to make some Alfredo Sauce for the dinner. Would you be willing?" "Sure", he said forcefully and with authority. "Well, I should tell you, we need quite a bit", she said with some timidity. "I'm sure I can handle it", he said forcefully and with authority. "Great! Because we need 3 gallons", she said, smug in the knowledge that I was hooked. "Great! No problem!" he said, silently cursing. 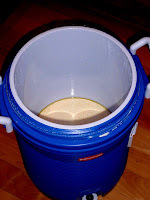 The problem with making 3 gallons of anything is up-sizing the recipe. The special problem with up-sizing Alfredo Sauce to 3 gallons is avoiding the Death Ninjas sent out by the American Heart Association. Alfredo Sauce is milk-fat mixed with butter fat with a shot of Parmesan Cheese thrown in just to make sure your arteries close completely. The Boonsta and I used two 2-gallon pots. The last time something this large was prepared, it was done by three witches and Macbeth ended up having a really bad day. By the time everything was loaded in to the pots I had to hold the mixing spoon with my thumb and forefinger; I didn't need a wooden spoon, I needed an oar. Place all of the ingredients, except the Parmesan Cheese, into a vat. Turn the heat to medium-low and start slowly stirring. 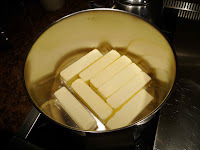 Melt all the butter and fully incorporate the sour cream. Bring this concoction to a simmer. As the temperature rises, you must keep stirring to avoid scorching the sauce. When the sauce is just to a low simmer, (about an hour), start adding the grated Parmesan one cup at a time. Fully incorporate each cup before adding the next cup. After all the cheese has been added, return the sauce to a low simmer and cook for 5 minutes. Total cooking time will approach 90 minutes if you're using the proper, slow warming, approach. Serve with cooked pasta, you should have enough to feed most of Iowa. There you go crablings. 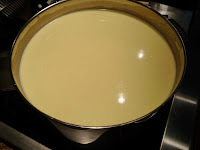 Alfredo Sauce is very easy to make, it's not even cooking, it's melting fat and stirring. Lots and lots of stirring. Also, as you can see, I'm a big believer in presentation when it comes to food, that's why I went with the blue 5-gallon water jug for transport. It made for a better contrast with the creamy yellow of the sauce. Next time it'll be something a bit more complicated, but for now, remember, you can do it, you can cook. Crabby Quiz: Who's the originator of the opening quote? I'm going to have to admit that I've never made Alfredo sauce before. You make it so easy, what with your 2 gallon pot and all. 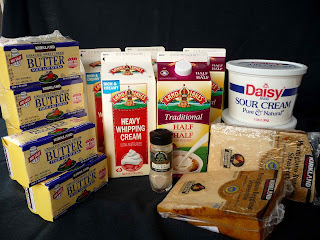 I'm going to have to try this out because there is nothing that I love more than butter and cream. Pasta with butter, cream, cheese and more fat neeeds a high acid wine to cut through the cloying sensation in your mouth from the dish. High acid wines come from cool climates, so a Pinot Grigio from the Collio region or Alto Adige in the Alps would be a nice choice. Look on the label, if it says Venezie or Veneto in the fine print, you don't want it. Another couple of nice norhtern Italian white wines with this acid zip are Gavi and Tocai Friulano. Expect to pay about $20 for either of these better wines. Take a bath in! LOL, I never thought of that idea. Maybe I'll sell it to some overpriced Paris-Hilton type spa as the latest in skin care. I think that halving the recipe should work just fine. I'd have a little extra cheese and half & half around just for last minute adjustments.